The All Blacks have been taking in the sights ahead of their eagerly anticipated first fixture on US soil at Soldier Field, the home ground of the Chicago Bears, where a record crowd of 62,000 is expected to fill the iconic American football stadium. 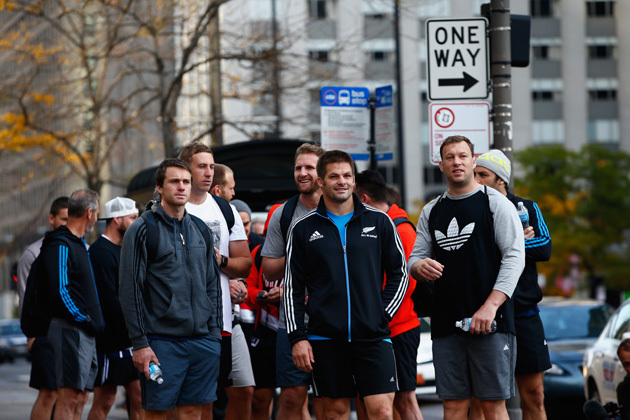 Ahead of Saturday’s game, the All Blacks have been going walkabout in the city, where rugby is still relatively unknown, hosting community sessions at Chicago’s Union Station and taking in the sights of the Windy City. Richie McCaw, winner of 134 caps and one of the world’s most experienced players, decided to add a new sport to his skillset when he stepped onto the ice to ‘Shoot the Puck” ahead of the Chicago Blackhawks‘ game against the Anaheim Ducks. Showing no nerves, and little signs of jetlag after a 17-hour flight, McCaw proved he had a smooth shooting action as he steered the puck goal bounds, to the delight of the assembled crowd. Whether the crowd will be as charitable on Saturday is a moot point, where the All Blacks will be expected to put Nigel Melville‘s USA team away with the minimum of fuss, as befitting on sides ranked at No 1 in the world and No 18 in the world.